The 1993 World Series was the 90th edition of Major League Baseball's championship series and the conclusion of the 1993 Major League Baseball season. A best-of-seven playoff series, it pitted the defending champions and American League (AL) champion Toronto Blue Jays against the National League (NL) champion Philadelphia Phillies. With Toronto ahead three games to two in the Series, but trailing Game 6 by a score of 6-5 with one out in the bottom of the ninth inning, with runners on first and second base and a count of two balls and two strikes, Joe Carter hit a game-winning three-run home run to win Game 6 by a score of 8-6 and the series four-games-to-two for Toronto, its second consecutive championship (the first team to repeat as champions since the 1977–78 Yankees). This was only the second Series concluded by such a home run (the first was in the 1960 World Series on a Bill Mazeroski home run for the Pittsburgh Pirates), and the first such occasion where a come-from-behind walk-off home run won a World Series. Larry Andersen was the only member of the 1993 Phillies to also play for them in the 1983 World Series, although Darren Daulton was a late season call-up in 1983, but only served as the bullpen catcher in the World Series. Fittingly, in Daulton's first ever MLB game, he was a catcher for Larry Andersen. The Series' first game sent two staff aces—Curt Schilling for Philadelphia and Juan Guzman for Toronto—against one another. The result was less than a pitcher's duel, however, as both teams scored early and often. The Philles struck first in the top of the first on RBI singles by John Kruk and Darren Daulton aided by two walks. In the bottom of the second, after two singles and a wild pitch, Paul Molitor's single and Tony Fernandez's groundout scored a run each to tie the game. The Phillies took a 3–2 lead in the third when Mariano Duncan hit a leadoff single, stole second and scored on Kruk's single, but the Blue Jays tied the game in the bottom half when Devon White reached third on left fielder's Milt Thompson's error and scored on Joe Carter's sacrifice fly. The Phillies retook the lead in the fifth inning when Duncan tripled with one out and scored on a wild pitch, but White hit a home run to tie the game in the bottom of the inning. The next inning, John Olerud hit a home run of his own to put Toronto on top 5–4. In the seventh, after two one-out singles, Schilling was relieved by David West, who allowed an RBI double to White and two-run double to Roberto Alomar to pad Toronto's lead to 8–4. The Phillies got a run in the ninth when Kruk hit a leadoff single, moved to second on an error and scored on Jim Eisenreich's two-out single, but Duane Ward got Ricky Jordan to fly out to end the game as Toronto won 8–5. Al Leiter pitched ​2 2⁄3 innings—in relief of an erratic Juan Guzman, who walked four in just five innings—for his first World Series win. Kruk had three hits for Philadelphia. Alomar made an amazing diving catch on a Lenny Dykstra looper behind first in the top of the fifth. In the second game of the Series, Dave Stewart was on the mound for Toronto and Terry Mulholland started for Philadelphia. Philadelphia jumped out to an early lead: in the third inning, After two walks, John Kruk and Dave Hollins hit back-to-back RBI singles, then Jim Eisenreich followed with a three-run home run to deep right-center to put them up 5–0. Toronto got on the scoreboard in the fourth inning courtesy of a Joe Carter two-run home run to left, then cut the Phillies' lead to 5–3 in the sixth when Roberto Alomar singled with two outs and scored on Tony Fernandez's double, but the Phillies got that run back in the seventh on Lenny Dykstra's home run off of Tony Castillo. Toronto cut the lead to 6–4 in the eighth when Paul Molitor hit a leadoff double off of Roger Mason, stole third and scored on John Olerud's sacrifice fly off of Mitch Williams. Alomar then walked and stole second, but was caught stealing third to end the inning. Williams then pitched a scoreless ninth as the Phillies won to tie the series. Mulholland pitched ​5 2⁄3 innings, allowing three earned runs, for the win. For Toronto, Pat Hentgen faced off against Philadelphia starter Danny Jackson in Game 3. Hentgen pitched a strong six innings, allowing just a single run, and the Toronto offense took care of the rest. In Jackson's previous postseason start against the Blue Jays, he had recorded a shutout (in the 1985 American League Championship Series), but he was not nearly as effective in this game. After a leadoff single and walk in the first, Paul Molitor's two-run triple and Joe Carter's sacrifice fly put Toronto up 3–0. Molitor's two-out home run in the third made it 4–0 Blue Jays, who then loaded the bases on three straight singles, but Jackson struck out Ed Sprague to end the inning without further damage. In the sixth, Roberto Alomar hit a leadoff single off of Ben Rivera, stole second and third and scored on Tony Fernandez's sacrifice fly. The Phillies got on the board in the bottom of the inning on Jim Eisenreich's RBI single with two on via two walks. In the top of the seventh, Rickey Henderson hit a leadoff double, then scored on Devon White's triple. After a walk and strikeout, Alomar's RBI single made it 7–1 Toronto. Bobby Thigpen relieved Rivera and walked Fernandez before Sprague's sacrifice fly made it 8–1 Blue Jays. Three straight one-out singles by Milt Thompson, Lenny Dykstra and Mariano Duncan off of Danny Cox in the bottom of the inning made it 8–2 Blue Jays. Molitor hit a leadoff single in the ninth off of Larry Andersen before Alomar's triple and Fernandez's single scored a run each to make it 10–2 Blue Jays. Duane Ward allowed a leadoff home run in the bottom of the inning to Thompson before retiring the next three hitters to end the game and give the Blue Jays a 2–1 series lead. Toronto manager Cito Gaston was once again faced with an unusual and difficult decision prior to game time. As the Series switched to the National League ballpark, Gaston could not use his designated hitter, Paul Molitor, unless he played him in the field. This was not unfamiliar to Gaston, as he had to do the same thing one year prior to keep Dave Winfield in his lineup. Molitor's hitting kept him in the lineup over John Olerud for the games in Philadelphia, where he would play first base. The decision was potentially controversial as Olerud had led the American League in batting over the season with a .363 average; moreover, Molitor was the less sure-handed fielder. Molitor, however, put these concerns to rest, going 3-for-4, hitting a home run in the third inning and driving in three runs, while playing adequately at first base. In the fourth game of the Series, Toronto sent Todd Stottlemyre to the mound while Philadelphia countered with Tommy Greene. It had been a rainy day in Philadelphia, which water-logged the aging turf at Veterans Stadium, making for particularly slippery conditions. Toronto loaded the bases in the first on double, walk and single. Paul Molitor was walked to force in a run before Tony Fernandez's single scored two more. In the bottom half, three walks loaded the bases for the Phillies before Jim Eisenreich walked to force in a run, then Milt Thompson's three-run triple put the Phillies up 4–3. Lenny Dykstra's two-run home run next inning made it 6–3 Phillies. In the top of the third, after a one-out walk and single, consecutive RBI singles by Tony Fernandez and Pat Borders cut the lead to 6–5. Roger Mason relieved Greene and after a groundout and walk, Devon White's two-run single put Toronto up 7–6, but the Phillies tied the game in the fourth when Dykstra doubled with two outs off of Al Leiter and scored on Mariano Duncan's single. Next inning, after a leadoff single, Darren Daulton's two-run home run put the Phillies up 9–7. After another single, Thompson's RBI double made it 10–7, then Dykstra's second home run of the game made it 12–7 Phillies. In the sixth, White hit a leadoff double before scoring on Roberto Alomar's single off of David West. After a single and hit-by-pitch loaded the bases, Fernandez's RBI groundout cut the Phillies' lead to 12–9, but they added a run in the bottom half when Dave Hollins hit a leadoff double off of Tony Castillo and scored on Thompson's two-out single. Next inning, a hit-by-pitch to Dalton with the bases loaded made it 14–9 Phillies. In the eighth, though, after a one-out single and walk off of Larry Andersen, Molitor's RBI double made it 14–10 Phillies. Fernandez then hit an RBI single off of Mitch Williams. A walk loaded the bases, then after a strikeout, Rickey Henderson's single and White's triple scored two runs each to put Toronto ahead 15–14. Duane Ward earned the save, retiring the last four Phillies batters. Three new World Series records were set, including the longest game (4:14), most total runs scored in a single game (29), and most runs scored by a losing team (14). Also, Charlie Williams became the first African American to serve as the home plate umpire for a World Series game. Two death threats directed towards Mitch Williams were phoned into Veterans Stadium as soon as it became evident that Williams was going to be the losing pitcher of Game 4. Williams was not aware of the death threats until after Game 5. The offenses were due for an off-day, and it came in Game 5 courtesy of a Curt Schilling (Philadelphia) and Juan Guzman (Toronto) pitching duel. Schilling shut down the previously unstoppable Toronto offense, limiting the team to just five hits and no runs. It was only the second time all season that Toronto had been shut out. Guzman pitched well in a losing effort, allowing only two runs and five hits in seven innings of work. The two runs scored as a result of scrappy play from the Philadelphia offense. In the first inning, Lenny Dykstra walked, stole second, moved to third on a Pat Borders throwing error, and scored on a John Kruk ground out. In the second inning, Darren Daulton opened with a double, took third on a ground out, and scored on a Kevin Stocker single. As it turned out, it was the final postseason baseball game in Veterans Stadium. It was demolished after the 2003 season. The sixth game in the Series was a rematch between Game 2 starters Terry Mulholland and Dave Stewart, who would have similar results. Toronto scored in the bottom of the first with a run-scoring Paul Molitor triple after a walk, Joe Carter sacrifice fly to score Molitor, and Roberto Alomar RBI single after a double. The Phillies got on the board in the fourth when Darren Daulton doubled with two outs and scored on Jim Eisenreich's single, but the Blue Jays got that run back in the bottom of the inning on when Alomar hit a leadoff double, moved to third on a groundout and scored on Ed Sprague's sacrifice fly. Paul Molitor added a home run in the fifth inning while the Toronto fans were chanting "MVP" for Paul, bringing the score to 5–1 for Toronto. Molitor became the first player in World Series history to have at least two home runs, two doubles, and two triples. In the seventh inning, Philadelphia fought back with five runs. After a walk and single, Lenny Dykstra hit a three-run home run to knock Stewart out of the game. Mariano Duncan singled off reliever Danny Cox, stole second, and scored on Dave Hollins's RBI single to tie the game. A walk and single loaded the bases before Pete Incaviglia hit a sacrifice fly to put the Phillies up 6–5. Philadelphia closer Mitch Williams came on to pitch the bottom of the ninth with his team clinging to a 6–5 lead. After beginning the inning by walking Rickey Henderson, Williams tried to counter Henderson's speed by using a slide-step style of pitching delivery. Prior to the game, Williams had never used the slide-step delivery in his career, and this may have cut back on his velocity. The walk to Henderson was followed by a Devon White fly out and a single by Paul Molitor that moved Henderson to second. 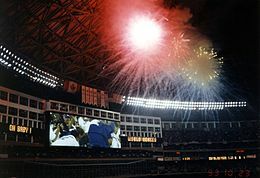 Fireworks in the SkyDome after Carter's home run. Joe Carter came up next and, with the count 2–2, he hit a three-run home run to win the game and the World Series. Just before the fifth and final pitch to Joe Carter, CBS Sports announcer Tim McCarver commented that Carter (relatively unproductive in the Series to date) looked awkward and uncomfortable at the plate. The same pitch allowed Blue Jays radio announcer Tom Cheek the opportunity to utter his famous "Touch 'em all, Joe" quote, when Joe Carter clinched the series. Carter joined Bill Mazeroski as one of the only two players to win a World Series with a home run in the bottom of the ninth inning. Carter was actively involved in the final play of the World Series for the second year in a row. In the previous year, Carter caught the final out as first baseman after relief pitcher Mike Timlin fielded Otis Nixon's bunt. Taking the 1993 ALCS into account (where he caught the final out in the outfield), he had been involved in the final play of three straight postseason series. American League president Dr. Bobby Brown presented the World Series Trophy instead of the Commissioner of Baseball; this event also occurred in the year before. The Blue Jays became the second expansion team to win two World Series championships, following the New York Mets in 1986. The Florida Marlins would win their second title in 2003, and the Kansas City Royals would accomplish the same feat in 2015. With the Montreal Canadiens winning the 1993 Stanley Cup Finals five months earlier, it marked the only time Canadian teams won multiple league championships among the four major North American team sports in a calendar year. —Mitch Williams on his feelings about surrendering the home run to Joe Carter Williams would be traded that off-season by the Phillies to the Astros. Both teams would experience absences from the postseason; the Phillies did not return to the postseason until 2007, or appear in another World Series until their championship season of 2008, bringing the city of Philadelphia its first championship since the 76ers swept the 1983 NBA Finals. The general manager of the Blue Jays, Pat Gillick, was general manager of the Phillies team that won the 2008 World Series. The Blue Jays did not qualify for the playoffs again until the 2015 season. By accumulating 45 runs over the course of the series, the Blue Jays scored the highest number of runs of any one series-winning team in World Series history. Only the series-losing 1960 New York Yankees have accumulated more runs, 55, in a series. The national radio broadcast was also provided by CBS, with Vin Scully and Johnny Bench on the call. Locally, the Series was called on WOGL-AM in Philadelphia by Harry Kalas, Richie Ashburn, Chris Wheeler, Andy Musser, and Garry Maddox and on CJCL-AM in Toronto by Jerry Howarth and Tom Cheek. Cheek's call of the Carter home run ("Touch 'em all Joe, you'll never hit a bigger home run in your life!") lives on in Blue Jays folklore. The 1993 series was Richie Ashburn's last as a Phillies broadcaster, as he died in 1997. Andy Musser also called his last World Series as a member of the Phillies' broadcast team; he retired in 2001 and died eleven years later. Tom Cheek never called another postseason game in his role as voice of the Blue Jays, from which he retired in 2005 prior to his death from brain cancer. Game 6 also marked Johnny Bench's final broadcast for CBS Radio after nine years (he would be replaced on CBS Radio's World Series broadcasts by Jeff Torborg), while Harry Kalas would not call another World Series until 2008. Kalas later died in 2009 prior to a game at Nationals Park in Washington, D.C.. Chris Wheeler continued to call games for the Phillies until being released in 2014 and Jerry Howarth continued to call Blue Jays games, moving into the primary play-by-play position following the death of Cheek, until his retirement before the 2018 season. Howarth would return to call postseason games when the Blue Jays qualified in 2015 and 2016, where they were eliminated in the ALCS both years. Fastball is hit to left field, down the line, in the corner, home run! Joe Carter who took the 2 and 0 pitch for a strike right down the middle hits the 2 and 1 (sic) pitch over the left field wall and the Toronto Blue Jays come back with 3 in the bottom of the ninth inning to become the World Champions yet again. The final score: Toronto 8, Philadelphia 6. Joe has had his moments. Trying to lay off that ball, low to the outside part of the plate, he just went after one. Two balls and two strikes on him. Here's the pitch on the way. A swing and a belt! Left field, way back, BLUE JAYS WIN IT! The Blue Jays are World Series Champions, as Joe Carter hits a three-run home run in the ninth inning and the Blue Jays have repeated as World Series Champions! Touch 'em all, Joe, you'll never hit a bigger home run in your life! The 2–2 pitch, line drive in deep left, this ball is outta here. Three-run home run, Joe Carter, and the Toronto Blue Jays are the world champions of baseball for the second straight year. A three-run home run in the bottom of the ninth by Joe Carter who's being mobbed at home plate. Now the 2-2. Well-hit down the left-field line! Way back and GONE! Joe Carter with a three-run homer! The winners and still world champions, the Toronto Blue Jays! 95 South Remixed their local hit "Whoot There It Is" turning into a special tribute to the Phillies. It is often confused with "Whoomp There It Is" by Tag Team; however, the songs are distinctly different. Toronto rapper Choclair refers to Joe Carter's walk-off home run in his 1999 song, "Let's Ride". On July 29, 2015, Toronto rapper Drake released a diss track against Philadelphia rapper Meek Mill entitled "Back to Back". The cover of the diss track features a picture of Joe Carter, just after hitting the series-clinching home run. Roger Angell's review of the Series in the New Yorker was entitled "Oh, What A Lovely War". ^ "1993 World Series Game 1 – Philadelphia Phillies vs. Toronto Blue Jays". Retrosheet. Retrieved September 13, 2009. ^ "1993 World Series Game 2 – Philadelphia Phillies vs. Toronto Blue Jays". Retrosheet. Retrieved September 13, 2009. ^ "1993 World Series Game 3 – Toronto Blue Jays vs. Philadelphia Phillies". Retrosheet. Retrieved September 13, 2009. ^ "1993 World Series Game 4 – Toronto Blue Jays vs. Philadelphia Phillies". Retrosheet. Retrieved September 13, 2009. ^ "1993 World Series Game 5 – Toronto Blue Jays vs. Philadelphia Phillies". Retrosheet. Retrieved September 13, 2009. ^ "1993 World Series Game 6 – Philadelphia Phillies vs. Toronto Blue Jays". Retrosheet. Retrieved September 13, 2009. ^ "WORLD SERIES; 'Wild Thing' One Time Too Often". October 24, 1993. Retrieved 2017-02-21. ^ Sheridan, Phil (October 30, 2008). "WORLD CHAMPS!—28 years later, Phillies again are baseball's best". Philadelphia Inquirer. p. A1. Retrieved March 20, 2011. ^ Roger Angell, "Oh, What A Lovely War." New Yorker November 23, 1993. Forman, Sean L. "1993 World Series". Baseball-Reference.com – Major League Statistics and Information. Archived from the original on November 30, 2007. Retrieved December 9, 2007. History of the World Series - 1993 at The SportingNews. Archived from the original on 2008. Angell, Roger (November 22, 1993). "Oh, What A Lovely War". New Yorker.